My good friend, Hollie, is guest blogging today. 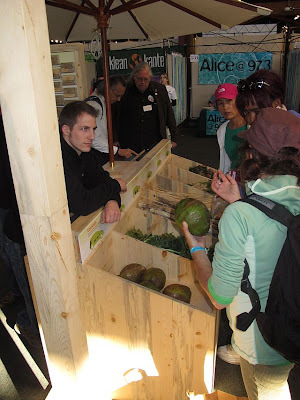 Her and I were together this past weekend at the Green Festival and I've allowed her sarcasm and whit to grace my blog. I hope you all pick up on her sense of humor and enjoy her weekend recap as much as I did... I just about peed my pants laughing when I read it, but that's probably just because I lived it, and trust me... this stuff was WAY more funny in person! 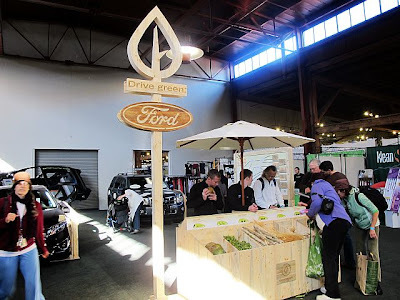 This past weekend Kate and I worked with the Ford Go Green initiative at the San Francisco Green Festival. 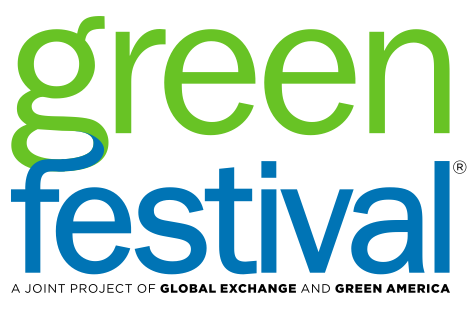 Working the Green Festival is quite different than other events we have worked in the past. I was approached by a co-worker that told me “to save Kate from that woman.” I looked over to Kate’s direction and she was stuck in conversation with a whack-job who looked like a man with coveralls and a tie on. This was, of course, the same man/lady that took our corn and started making obscene jesters with it, acting as if it were a man part and it was going in her mouth. So, of course, I try to tell Kate it’s time for lunch and the man/lady puts her hand in my face for me to go away. As I’m turning away she motioned for Kate to come in closer. She reached out her dirty hand for Kate to shake and then she grabs her and kisses her neck! Kate was traumatized and ran to lunch. Lots of the booths at the indoor festival were giving away free stuff, and every time we passed the free granola bars, Kate slyly took about two or three and put them in her pocket. I swear she had a suitcase full by the end of the weekend. Words of wisdom to live by, I guess! One of our co-workers, we'll call him Dustin, refers to us as the clones. It’s kind of funny because we don’t look alike - so we don’t really understand it - but we‘ve been told we compliment each other… whatever that means. Did you know that someone could tell you what blood type you are by reading your aura? Well, it’s true and the N.D. (Yes, not M.D. --- N.D…. naturalist something) guessed Kate as B and me as O. It’s crazy because he was right on. And if any of you are looking for a cure for anything…. Take more Selenium. But make sure you don’t take more than 15 pills a day, even though 1 pill is the suggested dose, as the side effect is that your toe nails will curl. Take under 15 and you are safe from Cancer, Cysts, AIDS, heart disease and pretty much everything else. He was a pretty trustworthy 70 something man….even though we spotted his medical bracelet under his jacket - we think he was just released from a hospital. And he may be a little crazy but Selenium may be worth a try! As much as Ford is doing for the environment, it is never enough for these environmentalists. We were constantly dealing with people dissecting exactly where Ford was getting the post consumer products and if the soy beans and produce were fully organic or genetically engineered. Because of course if Ford isn’t using organic, the world will end. 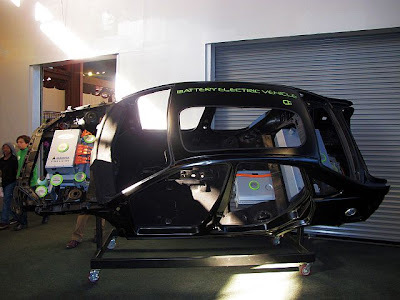 We spent our weekend talking about sustainable materials, hybrid vehicles, the range on an electric car, lithium ion batteries, seat cushion salsa, concept cars, beetle kill wood, E85, direct injected and turbocharged ecoboost engines, electric motors, bi product and CO2 emissions. So if you have any questions about the above topics, Kate and I are experts. Don’t get me wrong, it wasn’t all work. Just mostly work. We did go out to dinner at E & O Trading and Burger Bar in Union Square. We also spent a night out shopping. Sleep was lacking and our feet were hurting, but that never stops us! So that’s the sort of whirlwind weekend you get when the women go out and work and the men stay home with the dogs and play video games. Wow, what an amazing weekend! Seems like you have adventures every where you go! HAHHAHA! I am dying. I can only imagine how funny everything was in person. PS - Could you please tell me more about seat cushion salsa?